Another of my hands down favourites coming right up! 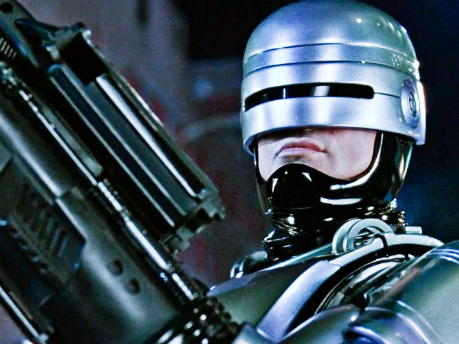 Robocop was my gore bar mitzvah a happy and disturbed time in my childhood where my dad thought it was fine to let an impressionable young boy watch one of the most violent movies of its day. Indeed Robocop is one hell of a movie. The good cop Robert Murphy chases some nasty blokes into a factory (why do these things always happen in factories) only to get blown away when cornered by the group. The helpful local corporation buys his corpse and melds his mind and for somereason the front of his face with an almost invincible robotic body. Awesome! Cue bad guys getting their comeuppance and fun had by all, if you love horror and dystopian futures then this is the movie you have looking for!